Eight easy-to-follow steps to better eating on the road—and on the run. Traveling can be tough enough, sitting for long periods of time, cooped up and cramped, with nothing but some of the most fattening, caloric food options out there. Here EatingWell has given some tips to help make your load a little lighter. 1. Beverages – opt for low-fat milk or water. 2. Skip the breading – Grilled chicken is always a better choice than anything coated and deep-fried. 3. Mind your fries – Reduce one of the worst sources of calories and trans fat by skipping the fries or opting for a small. 4. Watch the salad dressings – Often half the packet is plenty; the dressings may be surprisingly high in calories, fat and sodium. 5. Hold the mayo – avoid toppings and sauces is an easy way to save fat and calories. 6. 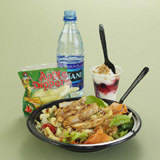 Seek out the veggies – some fast-food chains offer more veggie choices (e.g. Boston Market, KFC, Subway, Quiznos). 7. Eat like a kid – Choose drinks and meals from the children’s menu for smaller portion size. 8. Be informed – check out Nutritional Facts sheets and online menu calculators that many chains now offer.